Activity Based, Date, Dinner, Lunch, Warm Weather. This date had been a long time coming. I was bouncing between nerves and excitement. At the prompt of a text message, I hustled downstairs from my apartment and, when I opened the front door to my building, saw Ashley parallel parking directly in front of me. She saw me standing in the doorway and I made a sarcastic gesture as to say, “Not bad,” because really, it was the best possible spot she could have found. She stepped out of the car and her head peeked over the roof. I couldn’t believe she was there. It had been almost four years since I’d seen Ashley. Even then, I’d only hung out with her two or three times. She was a long time friend of one of my friends from college and I’d met her one summer when she visited campus. It was the first summer of college I was ever single and I had a thing for her as soon as I met her. She had a way about her that was alluring and she was always very cute. But of course, she had a boyfriend. Luckily, Ashley came back to visit again when school started and she and our mutual friend were crashing at my house after a party we were hosting. I’d also discovered that that Ashley no longer had a boyfriend. Unfortunately, I had been terribly sick that entire week and was barely coming out of it in time for the party. I was dead tired all night, but determined to hang out with Ashley, even though I had no clue at that point how to make a move. Finally, at the very end of the night, and with a lot of help from Ashley, we kissed. It lasted maybe five minutes. Then I fell asleep mid-make out. She left the next day and I don’t think I’d seen her since. I got a girlfriend a few weeks later and she went back to having a boyfriend. We had both either been in relationships or nowhere near each other over the interim four years. I never forgot about her though. I would drop by her Facebook page from time to time to see if she was single or in the country or alive. She’d just always stayed in the back of my mind as someone I would want to go out with should I ever have the chance. Even before I started the project, I got in touch with her and asked her out. Ashley came around the back of her car and gave me a hug. She looked adorable in her light summer dress. Better than I remembered. And I’d always thought she was beautiful. We went up to my apartment briefly to gather my things, use the bathroom, check directions and drink a couple glasses of water. If I’d learned anything at that point, it was that hydration was key to successful dating. I asked her about the overnight shift she had worked two nights prior, hoping that she was not totally wiped out from it, and she seemed to be doing just fine. The ride from Astoria to Coney Island was a long one but it was simple — jump on the N or Q and you’d be there eventually. There was so much to talk about that the hour and a half really wasn’t very much time at all. Honestly, Ashley and I barely knew each other. We’d only spoken a few times and everything else I knew about her was based on our mutual friend or, more likely, Facebook — everyone’s mutual friend. Ashley lived in New Haven, CT where she worked as a nurse. She had recently moved into a new place and so we got to talking about relocation. She’d be starting a part time program at NYU in the coming month and then the following summer, she planned to move down to NYC to attend school full time as she’d need to partake in clinical rotations. She mentioned that it would be good to talk to me when moving down there to get an idea of where to live, which immediately launched me into a description of all the gentrified neighborhoods of Brooklyn and Queens. She did not need this information right then, nor would she remember it, but for some reason I was compelled to continue on for several minutes. As soon as we were on the train, we talked about my job and I went into a bit more detail than I usually would have. We had a lot of time, so why not bore her with the minute details of my desk job? We talked about contentment in employment and what that could mean. I asked her about being a nurse and if she entered into it with the ambition to help people and make a difference. She knew it sounded cliche, but she really did do it for those altruistic reasons. She had had an experience with a death in the family that made health care closer to her own life and she saw the importance of it, thus convincing her to dedicate her life to it. She asked about what my dad did for work and I told her he was a carpenter. He had previously been a tree guy, when I was younger. (Not a humanoid tree or anything, just a guy that cut them down. I think the technical term is arborist.) Ashley’s mom worked in education and her father worked at a printing plant for his brother-in-law. Her parents were divorced. She had been sixteen when they separated. What an emotionally challenging age to begin with and then to have that piled on top of it. It sounded tough. We’d done a decent job catching each other up on our lives by the time we reached the end of the line. 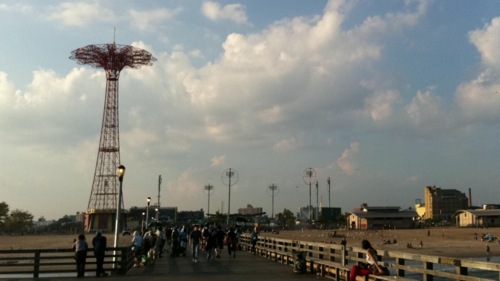 There it was: Coney Island! Oh look, hot dogs! We were both hungry so we headed straight for Nathan’s Hot Dogs, a Coney Island institution. Watching Kobayashi destroy the annual July 4th Nathan’s hot dog eating contest for the first time gave me hope that as a skinny kid, I could still ascend to competitive eating greatness. Ashley and I each got a dog and a giant lemonade. We took a seat at one of the picnic tables next to Nathan’s. Ashley asked me about One Hundred Dates, wanting to know if I worried that my dates would act differently because they knew they’d be on the blog. I told her that I tried not to. The people who agreed to date me either didn’t seem like people who would do that, or they would be just as apt to play it up on any old date. “So far, so good,” I told her. We hadn’t even finished our dogs before an unpleasant homeless man at the table next to us began yelling at the world around him. He was spiteful of everyone there and he also seemed to be yelling at the seagulls, and occasionally, God. He was telling the Lord up above that he was not afraid to die, warning God that He didn’t have control, or something like that. We were trying to have a serious conversation there but were repeatedly distracted by this man’s rant and eventually broke into laughter. It was just too ridiculous, the contrast between the conversations. Commenting on our somewhat delusional neighbor, Ashley said that while she had never wanted to do it for a career, her rotation in the psych ward had been her favorite. As we got up to relocate, walking and sipping our lemonades, I told her all about my paranoid schizophrenic, homeless uncle Andy. She commented that schizophrenia was one of the most difficult conditions to deal with and she seemed to understand a lot of his behavior as I described it to her. She went on to tell me that during her rotation, she met someone who had a legitimate case of split personality disorder. I wanted to ask her if she’d seen the movie Identity, but that seemed cheap and uneducated. I knew it was just a movie, but I still thought it was interesting. Her story quickly distracted me though and I forget all about that silly thought. We walked down the boardwalk, checking out the beach, concessions and amusements for the first time. It was sort of incredible how close the city was to Coney. High rise apartment buildings were right there. It made for a pretty interesting crowd down on the boardwalk. We stumbled upon the Coney Island Dancers, which wasn’t a dance troupe so much as a bunch of people freely boogying to dance music. There was one old, geeky white dude who was ridiculously entertaining. Ashley and I could only smile at the endearing man. I could have watched that guy for hours. We moved along just before we started feeling terrible about ourselves for watching. As we approached the entrance to the aquarium, I mentioned that the last time I’d been to an aquarium or zoo would likely have been sixth grade, which was thirteen years earlier. Scary thought. We tossed what was left of our giant drinks in the trash, bought our tickets and headed inside. As soon as we got in there, it was clear that Ashley was the pro. She understood that there was probably another window to the tank right around the corner and we didn’t all need to crowd at the first one. The first tank had a lot going on and it was pretty fun to observe sea life like that for the first time in so many years. As we made our way though the aquarium, the impact of Pixar’s movies was apparent. Finding Nemo was everywhere. I began speaking in silly voices for some the creatures in the tanks. I knew it was stupid, but it was so damn fun. Ashley seemed to think it was funny, or at the very least, she was humoring me. Seriously though, it was a blast making up characters for those little fellas. We exited to the outside portion of the aquarium and found some California seals. As we stood there, Ashley recieved a call from Kira, the mutual friend with whom I attended college. I told her to pick up, as I was sure Kira would find us being on a date to be amusing. Ashley talked to her for a few minutes and told her where she was and what she was doing. Kira passed on a hello and they were off the phone. Dammit. We had just missed the live animal show. In order to brighten our spirits, we made our way to the otters, those adorable little scamps of the ocean. The northern fur seals in the next tank sat with their noses high in the air looking like they were the poet laureates of the aquarium. It was official, I was going to personify all of the animals. I began speaking with a aristocratic affectation, which was how I imagined those guys talked to each other. After rounding the corner, we dove into a cavernous exhibit hall. Sea horses were kind of bizarre, fucked up creatures, huh? Something about them seemed not of this world. We found ourselves down below the walrus tank and, my goodness, those things were so awesome. The big one came right towards us, bounced off the glass and swiftly glided backward, upside down. SO AWESOME. I could have watch that for hours. Instead, we watched it for two minutes and then took a bathroom break. We carried on and exited the cavern a few minutes later. The next stop was the shark tank. There were families gathered around the tank and a couple big sharks swimming through it. There were also some giant turtles, which were pretty incredible to look at even though they were not really moving much. Ashley said one of the main reasons that we humans found sharks so scary was because there was no emotion in their eyes. I stared at one as it swam past and nodded silently in agreement. Exiting the shark tank, we went to check out the jellyfish exhibit briefly but there were too many strollers and breeders so we soon left. It was the Park Slope of the aquarium and we were clearly not at that stage of life yet. Out through the large metal turnstiles and back through the gates, we found ourselves on the boardwalk again. As we made our way west, back whence we had come, we passed by the dance party again. This time, there was more of a crowd and the music was a bit more intense. Our funny dancing man was no where to be seen. I looked up at the large, metal tower down the other end of the boardwalk and commented that it looked like one of those structures people used to design to look futuristic. It looked like something out of a World’s Fair. On the wall next to us was a large painted mural which depicted the same structure we were looking at. The letters next to the tower’s picture read, “1940: The Parachute Jump, standing 277 feet tall, is relocated from the 1939 World’s Fair.” I guess cruising Wikipedia relentlessly paid off every once in a while. Since we were at Coney Island and we were right by the Luna Park entrance, we decided to check out some rides. We bought ride credits at the ticket booth and then proceeded to peruse the park, figuring out which rides would be best. The Brooklyn Flyer seemed like a safe place to start, after all, it was just a big set of swings. As we climbed our way up, I asked Ashley if she was afraid of heights. Although I was, I had always liked climbing things, so I guess I was a little used to it. The ride was way scarier than I would have thought. I suppose I’d never been on swings that high. It looked like we were going to be thrown half-way across the park! Great view though. I learned that neither of us were particularly brave as we tried to figure out which ride to go on next. Ashley had been bungee jumping before though, which I thought was pretty nuts. I would have rather gone skydiving than bungee jumping, any day of the week. After weighing our various options, we decided on a ride called The Tickler, which I think is one of the creepiest names I’ve ever heard for a roller coaster. It was a smallish roller coaster which seated four passengers to a round car and it twisted and turned as it bombed down the track. It really didn’t look like much, and judging from the two ten year old girls seated next to us, that seemed to be the case as we boarded the ride. Once again, though, I was surprised. The Tickler did a little more than just tickle! Creepy, I told you. Since we were not terribly excited about any of the other rides we saw, we told ourselves, “go big or go home,” and decided to take on the world famous Cyclone. If you don’t know what it is, The Cyclone is an old wooden roller coaster, famous for being one of the biggest and best still in service today. We got through the line and up to the platform, but the first set of cars filled up right away, so we waited for the next one. What a ride. It was a hell of a coaster. With the rattling, shaking and screeching, it was definitely a thrill. I could only imagine how scary it would be to a generation of riders who didn’t know the likes of today’s modern coasters. That thing would be absolutely terrifying. As soon as we were off, Ashley noticed that she was missing the pendant from the end of her necklace. It must have fallen off in the car, which was already filling up again with passengers. I felt bad about it, even though I didn’t do anything except ask her to go to Coney Island for the day. Somehow, that was enough to feel at fault. That’s what dates did to me. Since I was the one who had asked her out, and I was the one who brought her to Coney Island, it must have been my fault that her necklace was suddenly incomplete. No one liked a date who was too hard on themselves though, so I shook it off. After our spin on The Cyclone, we’d had enough thrills for a little while, and Ashley was on the verge of a headache, so we walked back to the boardwalk. We stopped to grab a water and a lemonade and found ourselves a place to sit, sip and speak. It was there that we began to break in to more serious conversations. By the time we were up and walking again, we had landed on the topic of religion and growing up around it. What it had maybe taught us or how it had jaded us. I hadn’t grown up going to Catholic school like Ashley had, so our experiences were very different, but there was a great deal of common ground in how we saw the world as adults. Honestly people, if I could have Zack Morris’d the date right there, I would have wanted to tell you how well it was going and how much I was enjoying myself. The small crush on Ashley that I’d harbored for years was totally justified. She laughed when I was trying to be funny; she was serious when she needed to be; she was cute without trying at all; and for all the moments in between she seemed effortlessly comfortable. She was so right on. I could feel myself falling for her. Ashley mentioned that she was getting cold and I noticed that the sun was beginning to dip. I was not sure what to do since I really wanted to stay until the evening and ride the Wonder Wheel, but I didn’t have a long sleeved shirt or jacket to offer her. I told her that we could leave soon if she wanted, but she seemed determined to tough it out. Yeah, that was a tough question. At the time, I was writing these posts more regularly and future dates could see what I’d already done. I told her that I worried about the depreciation of not only my words when I wrote the posts, but also my actions. In that moment, I was concerned for the first time that day that Ashley might not think as highly of me as I would have liked her to. That worry, and my fear that Ashley might have been getting uncomfortably cold out there on the windy pier, made it a good time to head back to the boardwalk. On the way, I told her how it was still not easy being forward with women, despite having been on a number of dates at that point. To illustrate my point, I told her how I had had it all planned out in my head that when she arrived at my apartment, I was going to greet her and tell her how nice she looked, but when the time came, I balked and said no such thing. I then told her she looked great and that for whatever reason, I had trouble saying something like that without an excuse. Ashley pointed out that my telling her how I couldn’t say something, and then saying it, was indeed my excuse. Right on the nose with that one. In the meantime, the wind had died down and she didn’t seem to be freezing any longer. Ashley suggested some beers so we headed to Beer Island, the sandy beer garden back by the main entrance to the boardwalk. We grabbed ourselves a couple Coney Island Lagers, which Ashley was kind enough to pay for, and settled in to a table. By the time we were done with our drinks, the sun was over the horizon and it was beginning to get dark. It was a good time to feed ourselves, so we walked to a nearby fry shack. Sausage and peppers, a steak and cheese and two Red Stripes later, we were feeling better about life. We had finished our food and were nursing our beers when the fireworks began. During the summer, the Brooklyn Cyclones, a minor league baseball team, shot off fireworks after their games. Ashley jumped up and walked out to the center of the boardwalk to get a better view. She motioned for me to follow her, but I was already out of my seat. I stood there next to Ashley, on the Coney Island boardwalk, and watched fireworks go off on a gorgeous summer night. It was actually perfect. Scientists have proven that there is no better time in the world to kiss a date, especially when you really like her. Especially when you’re not drunk or horny. Especially when you’ve been waiting to kiss her again for almost four years. No game, no bad motives, no blog. Just honest desire. Instead, I said to Ashley, “Well, this is pretty perfect. 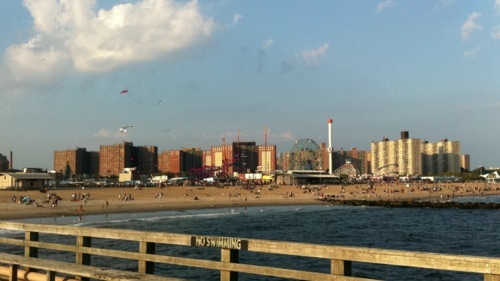 Coney Island, nice weather, fireworks,” and I turned away to watch the sky. There was a break in the fireworks and I thought they were over, so we began walking in the other direction. Then, as if a sign from God, the fireworks started back up and I knew I’d been given another shot. I pulled at Ashley’s arm so that she would turn and see the fireworks behind me and I kissed her. And Lord Almighty, it felt so good to do so. Opening my eyes, I retreated for a moment while Ashley made a crack about the fireworks — not the ones in the air, but the ones in front of us. I kissed her again before we headed off in search of The Wonder Wheel entrance. I was totally in love. I bought our tickets and we entered the line with no one in our way. We were on the wheel, in our own carriage, in no time. It was surreal. I was right back in eighth grade, riding a Ferris wheel with a girl for the first time. Would I try to kiss her again? Would I act like a gentlemen? It was not long before we’d gone around once and were back on top. As the New York skyline and Brooklyn Bridge peered at us from across the way, Ashley and I kissed. First the fireworks, and then this? It was so romantic, Ryan Gosling would have dropped his accent. The ride on The Wonder Wheel ended up being the perfect cap to an amazing day. There was simply nothing like a good, old fashioned, Ferris wheel ride with a lady. We walked back to the subway and found two seats on an empty car. It was another long trip home and we talked mostly about our families. I was learning so much about Ashley and I was really loving it all. By the time we made it back to Queens, the ride had amplified the tinge of a headache Ashley had been experiencing, so I found her two ibuprofen and gave her a tall glass of water. She laid there on my couch recovering and I sat next to her. It was quiet and peaceful. She asked about the guitars in the corner and I talked a bit about the bands I used to play in. She asked me to play her something on the guitar, so I fooled around, playing a few different things. I sought something light and pleasant so that she might fall asleep. I was out of ideas and Ashley was still awake, so I put on some 5 Pounds Lighter, my band from high school that I’d just told her about. I hadn’t listened to that EP in a long time. It was fun revisiting it with someone who would have never known me at that time and knew none of my friends in the band. I got to tell her about my bandmates and about the songs. It was a pleasant trip down memory lane. The room fell quiet as the EP ended and I realized how tired I was. I looked over to Ashley, who was laying with her legs stretched across my lap, quietly trying to sleep. And in that silence, there was such beauty. I was happy as I’d been in a very long time.